15 minutes play...BumbleBeans Inc.: Practice time for a newbie! Practice time for a newbie! This is my first brief post to 15 minutes play and as you can see below this is just a practice!! Presently I intend that the block will be 6" finished but I feel I have too many small pieces of fabric in the corner triangles, although on the other hand it could make for a more an interesting look (Indian Hatchet) when all 64 blocks are together. 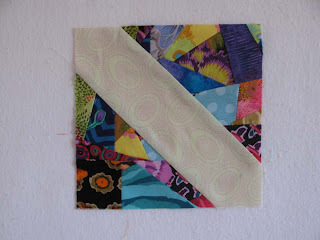 Alternatively I could use larger scraps of fabric in those triangles or go to an 8" finished block. I will have to decide in the next 24 hours as I really want to get busy on the quilt. Any feedback very welcome, this is the first time I have tried this sort of thing in all my 33years of quilting and I am really enjoying the process! I'm a newbie too! Isn't it freeing just cutting and sewing any which way? My advice is just have fun with it and see where it goes. I am also a newbie at making fabric, but what I did was making larger chunks of made fabric and cut whatever blocks I needed from these. It worked very well for me and I could just consentrate on the making fabric part. I also used a bit larger scraps or it would have taken me forever. I love the look of the tiny pieces. When I start making fabric I almost always start small or with a scrap that I trimmed from previous made fabric. If you are wondering about how the multiple seamed pieces will go together when you seam your blocks, you could make reverse blocks, so you are always sewing made fabric to your solid. Agree with everything Jane said. It's so satisfying to use those small scraps for something. Your block is charming! Thanks ladies for your welcome comments. The way I will be setting these blocks only a half of each pieced triangle will meet with another one - will put a few together over the weekend and post. Larger pieces would be a heck of a lot quicker I know but love the look of the small pieces. When I started the 15 Min process, I used very small scraps. I really like that look, so I still do it for smaller blocks. I have learned to use bigger scraps for the larger blocks. I have made a few more blocks today, still with the small scraps and really like the result but they are taking a longer time to make than I had thought they would, like yourself I would go for the bigger scraps when I make larger blocks. Am not a speed quilter, so I take time to savor each little tidbit as I sew. I will be sending you some of my scraps to swap. We are a good match, partner! Thanks Helen I'm looking forward to this scrap swap.